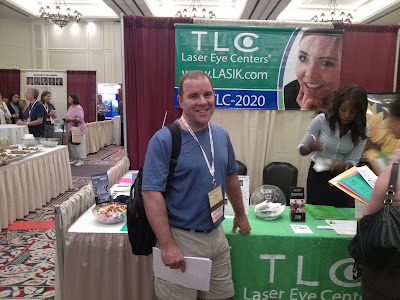 Three TLC VA Centers were represented at the Virginia Optometric Association's Annual Meeting this past weekend, June 22-24. TLC Tysons Corner, Charlottesville, and Richmond hosted a booth at the Convention's Exhibition Hall. This is just one way that TLC demonstrates it's commitment to the optometric profession. our booth at the VOA Convention in Williamsburg. TLC Tysons Corner would like to congratulate our Affiliates that hold positions within the VOA and our local Northern Virginia Optometric Society. 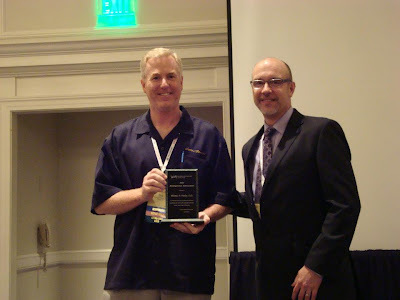 Also, Dr. Tom Finley was recognized for his contributions to our profession. Hmm ... I guess technically I am also an Affiliate? I was reappointed for another three-year term on the Board, too. Dr. Tom Finley received the Distinguished Service Award.